ekadā—once upon a time; krīḍamānāḥ—now Kṛṣṇa, being still more grown up, was playing with other children of the same age; te—they; rāma-ādyāḥ—Balarāma and others; gopa-dārakāḥ—other boys born in the same neighborhood of the cowherd men; kṛṣṇaḥ mṛdam bhakṣitavān—O Mother, Kṛṣṇa has eaten earth (a complaint was lodged); iti—thus; mātre—unto mother Yaśodā; nyavedayan—they submitted. Here is another of Kṛṣṇa’s transcendental activities invented to please the gopīs. First a complaint was lodged with mother Yaśodā about Kṛṣṇa’s stealing, but mother Yaśodā did not chastise Him. Now, in an attempt to awaken mother Yaśodā’s anger so that she would chastise Kṛṣṇa, another complaint was invented—that Kṛṣṇa had eaten earth. sā—mother Yaśodā; gṛhītvā—taking; kare—within the hands (being anxious about what Kṛṣṇa might have eaten); kṛṣṇam—Kṛṣṇa; upālabhya—wanted to chastise Him; hita-eṣiṇī—because she was anxious for the welfare of Kṛṣṇa, she became very much agitated, thinking, “How is it that Kṛṣṇa has eaten earth?”; yaśodā—mother Yaśodā; bhaya-sambhrānta-prekṣaṇa-akṣam—began to look very carefully within Kṛṣṇa’s mouth in fear, to see if Kṛṣṇa had eaten something dangerous; abhāṣata—began to address Kṛṣṇa. Upon hearing this from Kṛṣṇa’s playmates, mother Yaśodā, who was always full of anxiety over Kṛṣṇa’s welfare, picked Kṛṣṇa up with her hands to look into His mouth and chastise Him. Her eyes fearful, she spoke to her son as follows. kasmāt—why; mṛdam—dirt; adānta-ātman—You restless boy; bhavān—You; bhakṣitavān—have eaten; rahaḥ—in a solitary place; vadanti—are lodging this complaint; tāvakāḥ—Your friends and playmates; hi—indeed; ete—all of them; kumārāḥ—boys; te—Your; agrajaḥ—older brother; api—also (confirms); ayam—this. Dear Kṛṣṇa, why are You so restless that You have eaten dirt in a solitary place? This complaint has been lodged against You by all Your playmates, including Your elder brother, Balarāma. How is this? na—not; aham—I; bhakṣitavān—have eaten dirt; amba—My dear mother; sarve—all of them; mithya-abhiśaṁsinaḥ—all liars, simply complaining against Me so that you may chastise Me; yadi—if it is actually a fact; satya-giraḥ—that they have spoken the truth; tarhi—then; samakṣam—directly; paśya—see; me—My; mukham—mouth. Lord Śrī Kṛṣṇa replied: My dear mother, I have never eaten dirt. All My friends complaining against Me are liars. If you think they are being truthful, you can directly look into My mouth and examine it. 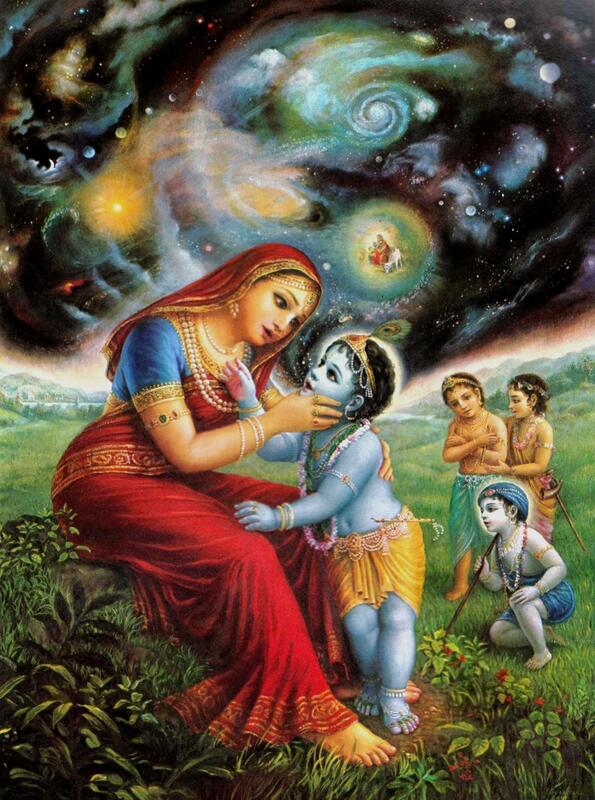 Kṛṣṇa presented Himself as an innocent child to increase the transcendental ecstasy of maternal affection. As described in the śāstra, tāḍana-bhayān mithyoktir vātsalya-rasa-poṣikā. This means that sometimes a small child speaks lies. For example, he may have stolen something or eaten something and yet deny that he has done so. We ordinarily see this in the material world, but in relation to Kṛṣṇa it is different; such activities are meant to endow the devotee with transcendental ecstasy. The Supreme Personality of Godhead was playing as a liar and accusing all the other devotees of being liars. As stated in Śrīmad-Bhāgavatam (10.12.11), kṛta-puṇya-puñjāḥ: a devotee may attain such an ecstatic position after many, many births of devotional service. Persons who have amassed the results of a vast amount of pious activities can attain the stage of associating with Kṛṣṇa and playing with Him like ordinary playmates. One should not consider these transactions of transcendental service to be untruthful accusations. One should never accuse such devotees of being ordinary boys speaking lies, for they attained this stage of associating with Kṛṣṇa by great austerities (tapasā brahmacaryeṇa śamena ca damena ca [SB 6.1.13]). yadi—if; evam—it is so; tarhi—then; vyādehi—open Your mouth wide (I want to see); iti uktaḥ—in this way ordered by mother Yaśodā; saḥ—He; bhagavān—the Supreme Personality of Godhead; hariḥ—the Supreme Lord; vyādatta—opened His mouth; avyāhata-aiśvaryaḥ—without minimizing any potencies of absolute opulence (aiśvaryasya samagrasya); krīḍā—pastimes; manuja-bālakaḥ—exactly like the child of a human being. Mother Yaśodā challenged Kṛṣṇa, “If You have not eaten earth, then open Your mouth wide.” When challenged by His mother in this way, Kṛṣṇa, the son of Nanda Mahārāja and Yaśodā, to exhibit pastimes like a human child, opened His mouth. Although the Supreme Personality of Godhead, Kṛṣṇa, who is full of all opulences, did not disturb His mother’s parental affection, His opulence was automatically displayed, for Kṛṣṇa’s opulence is never lost at any stage, but is manifest at the proper time. Without disturbing the ecstasy of His mother’s affection, Kṛṣṇa opened His mouth and displayed His own natural opulences. When a person is given varieties of food, there may be a hundred and one varieties, but if one likes ordinary śāka, spinach, he prefers to eat that. Similarly, although Kṛṣṇa was full of opulences, now, by the order of mother Yaśodā, He opened wide His mouth like a human child and did not neglect the transcendental humor of maternal affection. sā—mother Yaśodā; tatra—within the wide-open mouth of Kṛṣṇa; dadṛśe—saw; viśvam—the whole universe; jagat—moving entities; sthāsnu—maintenance of nonmoving entities; ca—and; kham—the sky; diśaḥ—the directions; sa-adri—with the mountains; dvīpa—islands; abdhi—and oceans; bhū-golam—the surface of the earth; sa-vāyu—with the blowing wind; agni—fire; indu—the moon; tārakam—stars; jyotiḥ-cakram—the planetary systems; jalam—water; tejaḥ—light; nabhasvān—outer space; viyat—the sky; eva—also; ca—and; vaikārikāṇi—creation by transformation of ahaṅkāra; indriyāṇi—the senses; manaḥ—mind; mātrāḥ—sense perception; guṇāḥ trayaḥ—the three material qualities (sattva, rajas and tamas); etat—all these; vicitram—varieties; saha—along with; jīva-kāla—the duration of life of all living entities; svabhāva—natural instinct; karma-āśaya—resultant action and desire for material enjoyment; liṅga-bhedam—varieties of bodies according to desire; sūnoḥ tanau—in the body of her son; vīkṣya—seeing; vidārita-āsye—within the wide-open mouth; vrajam—Vṛndāvana-dhāma, Nanda Mahārāja’s place; saha-ātmānam—along with herself; avāpa—was struck; śaṅkām—with all doubts and wonder. When Kṛṣṇa opened His mouth wide by the order of mother Yaśodā, she saw within His mouth all moving and nonmoving entities, outer space, and all directions, along with mountains, islands, oceans, the surface of the earth, the blowing wind, fire, the moon and the stars. She saw the planetary systems, water, light, air, sky, and creation by transformation of ahaṅkāra. She also saw the senses, the mind, sense perception, and the three qualities goodness, passion and ignorance. She saw the time allotted for the living entities, she saw natural instinct and the reactions of karma, and she saw desires and different varieties of bodies, moving and nonmoving. Seeing all these aspects of the cosmic manifestation, along with herself and Vṛndāvana-dhāma, she became doubtful and fearful of her son’s nature. All the cosmic manifestations that exist on the gross and subtle elements, as well as the means of their agitation, the three guṇas, the living entity, creation, maintenance, annihilation and everything going on in the external energy of the Lord—all this comes from the Supreme Personality of Godhead, Govinda. Everything is within the control of the Supreme Personality of Godhead. This is also confirmed in Bhagavad-gītā (9.10). Mayādhyakṣeṇa prakṛtiḥ sūyate sa-carācaram: everything in the material nature (prakṛti) works under His control. Because all these manifestations come from Govinda, they could all be visible within the mouth of Govinda. Quite astonishingly, mother Yaśodā was afraid because of intense maternal affection. She could not believe that within the mouth of her son such things could appear. Yet she saw them, and therefore she was struck with fear and wonder. kim—whether; svapnaḥ—a dream; etat—all this; uta—or otherwise; deva-māyā—an illusory manifestation by the external energy; kim vā—or else; madīyaḥ—my personal; bata—indeed; buddhi-mohaḥ—illusion of intelligence; atho—otherwise; amuṣya—of such; eva—indeed; mama arbhakasya—of my child; yaḥ—which; kaścana—some; autpattikaḥ—natural; ātma-yogaḥ—personal mystic power. [Mother Yaśodā began to argue within herself:] Is this a dream, or is it an illusory creation by the external energy? Has this been manifested by my own intelligence, or is it some mystic power of my child? When mother Yaśodā saw this wonderful manifestation within the mouth of her child, she began to argue within herself about whether it was a dream. Then she considered, “I am not dreaming, because my eyes are open. I am actually seeing what is happening. I am not sleeping, nor am I dreaming. Then maybe this is an illusion created by devamāyā. But that is also not possible. What business would the demigods have showing such things to me? I am an insignificant woman with no connection with the demigods. Why should they take the trouble to put me into devamāyā? That also is not possible.” Then mother Yaśodā considered whether the vision might be due to bewilderment: “I am fit in health; I am not diseased. Why should there be any bewilderment? It is not possible that my brain is deranged, since I am ordinarily quite fit to think. Then this vision must be due to some mystic power of my son, as predicted by Gargamuni.” Thus she finally concluded that the vision was due to her son’s activities, and nothing else. atho—therefore she decided to surrender unto the Supreme Lord; yathā-vat—as perfectly as one can perceive; na—not; vitarka-gocaram—beyond all arguments, reason and sense perception; cetaḥ—by consciousness; manaḥ—by mind; karma—by activities; vacobhiḥ—or by words; añjasā—taking all of them together, we cannot understand them; yat-āśrayam—under whose control; yena—by whom; yataḥ—from whom; pratīyate—can be conceived only that from Him everything emanates; su-durvibhāvyam—beyond our sense perception or consciousness; praṇatā asmi—let me surrender; tat-padam—at His lotus feet. Therefore let me surrender unto the Supreme Personality of Godhead and offer my obeisances unto Him, who is beyond the conception of human speculation, the mind, activities, words and arguments, who is the original cause of this cosmic manifestation, by whom the entire cosmos is maintained, and by whom we can conceive of its existence. Let me simply offer my obeisances, for He is beyond my contemplation, speculation and meditation. He is beyond all of my material activities. We should know that material suffering due to the material body will come and go. Therefore we must tolerate the suffering and proceed with discharging our duty as ordained by our spiritual master. aham—my existence (“I am something”); mama—my; asau—Nanda Mahārāja; patiḥ—husband; eṣaḥ—this (Kṛṣṇa); me sutaḥ—is my son; vraja-īśvarasya—of my husband, Nanda Mahārāja; akhila-vitta-pā—I am the possessor of unlimited opulence and wealth; satī—because I am his wife; gopyaḥ ca—and all the damsels of the cowherd men; gopāḥ—all the cowherd men (are my subordinates); saha-godhanāḥ ca—with the cows and calves; me—my; yat-māyayā—all such things addressed by me are, after all, given by the mercy of the Supreme; ittham—thus; kumatiḥ—I am wrongly thinking they are my possessions; saḥ me gatiḥ—He is therefore my only shelter (I am simply instrumental). It is by the influence of the Supreme Lord’s māyā that I am wrongly thinking that Nanda Mahārāja is my husband, that Kṛṣṇa is my son, and that because I am the queen of Nanda Mahārāja, all the wealth of cows and calves are my possessions and all the cowherd men and their wives are my subjects. Actually, I also am eternally subordinate to the Supreme Lord. He is my ultimate shelter. 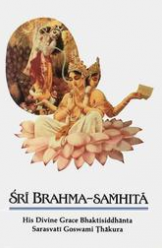 ittham—in this way; vidita-tattvāyām—when she understood the truth of everything philosophically; gopikāyām—unto mother Yaśodā; saḥ—the Supreme Lord; īśvaraḥ—the supreme controller; vaiṣṇavīm—viṣṇumāyā, or yogamāyā; vyatanot—expanded; māyām—yogamāyā; putra-sneha-mayīm—very much attached because of maternal affection for her son; vibhuḥ—the Supreme Lord. Mother Yaśodā, by the grace of the Lord, could understand the real truth. But then again, the supreme master, by the influence of the internal potency, yogamāyā, inspired her to become absorbed in intense maternal affection for her son. Although mother Yaśodā understood the whole philosophy of life, at the next moment she was overwhelmed by affection for her son by the influence of yogamāyā. Unless she took care of her son Kṛṣṇa, she thought, how could He be protected? She could not think otherwise, and thus she forgot all her philosophical speculations. This forgetfulness is described by Śrīla Viśvanātha Cakravartī Ṭhākura as being inspired by the influence of yogamāyā (mohana-sādharmyān māyām). Materialistic persons are captivated by mahāmāyā, whereas devotees, by the arrangement of the spiritual energy, are captivated by yogamāyā. sadyaḥ—after all these philosophical speculations, mother Yaśodā fully surrendered to the Supreme Personality of Godhead; naṣṭa-smṛtiḥ—having gotten rid of the memory of seeing the universal form within Kṛṣṇa’s mouth; gopī—mother Yaśodā; sā—she; āropya—seating; āroham—on the lap; ātmajam—her son; pravṛddha—increased; sneha—by affection; kalila—affected; hṛdayā—the core of her heart; āsīt—became situated; yathā purā—as she was formerly. Immediately forgetting yogamāyā’s illusion that Kṛṣṇa had shown the universal form within His mouth, mother Yaśodā took her son on her lap as before, feeling increased affection in her heart for her transcendental child. trayyā—by studying the three Vedas (Sāma, Yajur and Atharva); ca—also; upaniṣadbhiḥ ca—and by studying the Vedic knowledge of the Upaniṣads; sāṅkhya-yogaiḥ—by reading the literature of sāṅkhya-yoga; ca—and; sātvataiḥ—by the great sages and devotees, or by reading Vaiṣṇava-tantra, Pañcarātras; upagīyamāna-māhātmyam—whose glories are worshiped (by all these Vedic literatures); harim—unto the Supreme Personality of Godhead; sā—she; amanyata—considered (ordinary); ātmajam—as her own son. The glories of the Supreme Personality of Godhead are studied through the three Vedas, the Upaniṣads, the literature of Sāṅkhya-yoga, and other Vaiṣṇava literature, yet mother Yaśodā considered that Supreme Person her ordinary child. As stated in Bhagavad-gītā (15.15) by the Supreme Personality of Godhead, Kṛṣṇa, the purpose of studying the Vedas is to understand Him (vedaiś ca sarvair aham eva vedyaḥ). Śrī Caitanya Mahāprabhu explained to Sanātana Gosvāmī that there are three purposes in the Vedas. One is to understand our relationship with Kṛṣṇa (sambandha), another is to act according to that relationship (abhidheya), and the third is to reach the ultimate goal (prayojana). The word prayojana means “necessities,” and the ultimate necessity is explained by Śrī Caitanya Mahāprabhu. premā pum-artho mahān: the greatest necessity for a human being is the achievement of love for the Supreme Personality of Godhead. Here we see that mother Yaśodā is on the highest stage of necessity, for she is completely absorbed in love for Kṛṣṇa. In the beginning, the Vedic purpose is pursued in three ways (trayī)—by karma-kāṇḍa, jñāna-kāṇḍa and upāsanā-kāṇḍa. When one reaches the complete, perfect stage of upāsanā-kāṇḍa, one comes to worship Nārāyaṇa, or Lord Viṣṇu. When Pārvatī asked Lord Mahādeva, Lord Śiva, what is the best method of upāsanā, or worship, Lord Śiva answered, ārādhanānāṁ sarveṣāṁ viṣṇor ārādhanaṁ param. Viṣṇūpāsanā, or viṣṇv-ārādhana, worship of Lord Viṣṇu, is the highest stage of perfection, as realized by Devakī. But here mother Yaśodā performs no upāsanā, for she has developed transcendental ecstatic love for Kṛṣṇa. Therefore her position is better than that of Devakī. In order to show this, Śrīla Vyāsadeva enunciates this verse, trayyā copaniṣadbhiḥ etc. “As men surrender unto Me, I reward them accordingly. Everyone follows My path in all respects, O son of Pṛthā.” One may be a karmī, a jñānī, a yogī and then a bhakta or prema-bhakta. But the ultimate stage of realization is prema-bhakti, as actually demonstrated by mother Yaśodā.